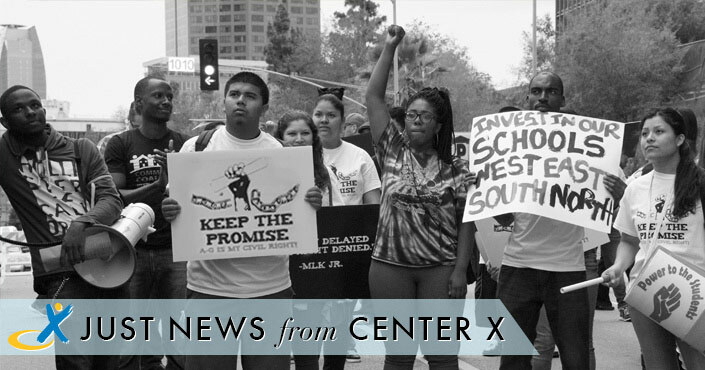 Just News from Center X is a free weekly education news blast. The students of Marjory Stoneman Douglas High School have catalyzed a social movement demanding an end to gun violence. While their leadership and moral authority have undoubtedly taken the movement to another level, youth-led activism against gun violence is not, in fact, new. In Florida in 2013, for example, members of Power U and Dream Defenders took over the state capitol to protest the “stand your ground” laws that allowed Trayvon Martin’s killer to go free, an event that helped give rise to the Black Lives Matter movement. Organizations led by young people of color have been working to end violence in their schools and on their streets for years, even decades. While some adults are focusing on the divisions between these constituencies, the young organizers themselves are finding common cause. Student leaders from Parkland have taken the time to listen and learn from their black and brown peers. Two weeks after the shooting, they joined Miami youth in a meeting organized by Power U and Dream Defenders to explore an alignment in their struggles. Similar meetings have taken place with young people from Chicago, Los Angeles, and other cities. They’re called “WARM demanders” and “cultural guardians,” polite nods to the additional roles with which African-American and Latino teachers – often the only teachers of color in their schools – are typically tasked: disciplinarian, mentor, translator. Lawrence Battle, a 29-year-old African-American social studies teacher at YES Prep’s White Oak campus in Houston, would prefer to see those roles be ones of leadership positions: instructional coach, principal, school administrator. “It is imperative that students see a reflection of themselves in the classroom, in the administration and in the highest level of education,” Battle says. “We must put more men and women of color in these classrooms to show students that we are invested in your future, we are here and we care about what happens to you and we’re here to guide you through a world that presents so many distractions.” But Battle is up against, well, a battle. Teachers of color make up less than 20 percent of the teaching workforce at a time when students of color, once called minority students, are now decidedly the majority in K-12 classrooms. Teens take the national stage, armed with … civics lessons? When the fire alarm went off at Marjory Stoneman Douglas High School on Feb. 14, Rebecca Schneid’s teacher hid her in the newspaper closet. Surrounded by stacks of old editions of the school newspaper The Eagle Eye, Rebecca texted her mom: “This is a code red and I don’t think it’s a drill.” As editor-in-chief of the school newspaper, the closet used to be Rebecca’s “favorite place on Earth.” Almost a month after the shooting, she says she still has bad days, thinking about hiding in the hot closet for 90 minutes while 17 of her classmates and teachers were killed. But Rebecca is not avoiding The Eagle Eye. Since returning to school, she has written articles about the NRA’s lobbying efforts and the #NeverAgain movement. Someday, these articles will fill the same closet where she hid. “It’s very symbolic,” says Rebecca, a junior. “The irony is not lost on me.” A leader of the school newspaper, politics club member, AP US history student, and participant on the youth cabinet of US Rep. Ted Deutch (D) of Florida, Rebecca may seem uniquely positioned to lead Stoneman Douglas students’ political fight for gun control. She is – but she is not the only one. One day in February may have saved Mia Freeman’s life. A second day changed it forever. On Feb. 2, Mia’s fourth-period class, which had been meeting in her high school’s freshman building, was moved back to its original classroom space on another part of the campus. On Feb. 14, a former student brought a semiautomatic rifle into the freshman building and started firing, killing 17 people. It was what happened that day at Marjory Stoneman Douglas High School in Parkland, Fla., that brought Mia and her classmate Hayley Licata to talk to a crowd of students at Shalhevet High School, a private Jewish school in Mid-Wilshire, on Friday. They had come to join L.A. in the March for Our Lives, spearheaded by Parkland students, taking place Saturday in locations worldwide. On Saturday, they will be speaking to a crowd of thousands. But first, Rabbi Yoshi Zweiback of Stephen S. Wise Temple in Bel-Air brought them to share their experiences Friday with young people at three Jewish schools and a synagogue. Conservative Christian colleges, once relatively insulated from the culture war, are increasingly entangled in the same battles over LGBT rights and related social issues that have divided other institutions in America. Students and faculty at many religious institutions are asked to accept a “faith statement” outlining the school’s views on such matters as evangelical doctrine, scriptural interpretation and human sexuality. Those statements often include a rejection of homosexual activity and a definition of marriage as the union of one man and one woman. Changing attitudes on sexual ethics and civil rights, however, are making it difficult for some schools, even conservative ones, to ensure broad compliance with their strict positions. “Millennials are looking at the issue of gay marriage, and more and more they are saying, ‘OK, we know the Bible talks about this, but we just don’t see this as an essential of the faith,’ ” says Brad Harper, a professor of theology and religious history at Multnomah University, an evangelical Christian institution in Portland, Ore.
It’s the end of the day in Mr. Tim’s kindergarten classroom at the International Community School in Oakland. A dozen 5-year-olds gather around an aquarium and meticulously curve their fingers into tiny heart shapes. Pulling their hands close to their chests, then pressing them out, with heart shapes extended, they say in unison, “We love you, Maurice.” Maurice is a red-eared slider, one of the most popular pet turtles on the market. He is also the beloved class pet, seven years and counting, in Timothy Douglas’ kindergarten classroom. Like many class pets, Maurice symbolizes a classroom feature that has long been common in schools. But now, in some classrooms, class pets are doing more than helping children learn about animals. They are being integrated into teachers’ efforts to help young students learn social and emotional skills, such as self-awareness, self-management, responsibility and relationship building. On Saturday, thousands of youth activists are expected to participate in the “March for Our Lives,” — in Washington, D.C.; in Accra, Ghana, Israel, Chile and elsewhere around the world. Lane Murdock, a 15-year-old from Connecticut, will be in D.C. for the protest. Murdock wrote a petition after the Parkland shooting calling for gun control — it went viral and morphed into a school walkout planned for April with more than 1,000 schools. “I hope all the monumental symbolism produced can continue to help fuel the movement,” says Lane, “as well as help bring some concrete change.” Lane has been in touch with survivors from Marjory Stoneman Douglas High School and is “thrilled just to see everyone’s faces, to talk with them.” “For so long I have seen them on a screen. In a way, this [march] helps transfer me out of an online presence to a physical, real-world one.” Lane is part of a larger organized youth effort for gun control — which comes amid a resurgence of liberal activism. And these teens show no signs of stopping. Contemporaneous demands to end anti-black racism, reform immigration policies and the highlighting of the nationwide culture of sexual harassment continue to dominate headlines in 2018. But we’ve seen this before. Can educational data be used to actually help schools get better? That’s the hope behind a push to bring to K-12 schools a management philosophy known as “continuous improvement” that has flourished in fields such as health care, manufacturing, and social services. But experts contend that the K-12 education system’s current data infrastructure, built in response to the federal No Child Left Behind Law and focused primarily on holding schools accountable, looms as a significant barrier. “New data systems really have to allow [teachers and principals] to say what they want to accomplish, and determine whether they’ve accomplished it,” said Louis Gomez, a professor of education and information studies at the University of California, Los Angeles, and a co-author of the 2015 book, Learning to Improve, How America’s Schools Can Get Better at Getting Better. “Just monitoring how we’re doing is not going to help us get better.” Examples of what an improvement-based data infrastructure actually looks like in practice are few and far between. High school seniors across the state are waiting on news that will shape the rest of their lives. This month they find out whether they are among the thousands being admitted to the University of California or California State University. Both UCs and CSUs are struggling to find space for qualified residents at overcrowded campuses, and tens of thousands of eligible students will be turned away. If they leave the state for college, and don’t come back, it could be trouble for the state’s economy. This month, to mark the 150th anniversary of the University of California, President Janet Napolitano laid out steps to meet growing demand. She called on chancellors to graduate more students in four years, clearing the way for new students, and advocated for a policy that would guarantee admission to qualified community college transfer students. Meanwhile, this week CSU trustees approved policy changes to redirect eligible applicants to campuses with space, instead of rejecting them outright. The changes go into effect for fall 2019 applicants. But as California’s public universities scramble to accommodate more students, nearby out-of-state schools are welcoming them with open arms. About employment, housing, and the military—institutions central to Americans’ social life—Martin Luther King Jr. had plenty to say. But about schools and education, perhaps surprisingly, he said less. One reason may have been timing. The landmark education battle of the civil-rights movement took place when King was at the beginning of his career. The Supreme Court struck down the legality of “separate but equal” public schools in 1954, the year he became a pastor, one year after he got married, and one year before he completed his doctoral work. Although many of the educational fights of King’s era were local and legislative, we can infer from his writings and speeches that his hope for the educational future of America’s black children was more ambitious than desegregation alone. In 1947, as an undergraduate at Morehouse College, King published in the campus newspaper a short treatise on the purpose of education. He argued that to benefit society, high-quality education should focus on developing students’ critical thinking and moral compass. Linda Brown Thompson of Brown v. Board of Education died this week. In 1954, the decision was supposed to desegregate schools. Now, 64 years later, NPR’s Audie Cornish speaks with Georgetown University law professor Sheryll Cashin about the effects. The faces of 30 white men, all speakers at an applied history conference this month at Stanford University, certainly grabbed attention as the images circulated widely this week. And that’s how the main organizer, the conservative British historian Niall Ferguson, a senior fellow at the Hoover Institution, found himself on the defensive two weeks after the conference had ended. Propelling the blowup was a tweet about the “all-male history conference” posted on Wednesday by Ana Lucia Araujo, a history professor at Howard University in Washington. “This goes for the Guinness Book of the century!” she wrote above the roster showing “a team of 30 white male historians” listed as panelists and speakers at the conference on the campus near Palo Alto, Calif. “What a shame.” The conference in the heart of Silicon Valley had actually been held March 2 and 3, with a dozen sessions, including ones dedicated to questions like “Are recent developments in American politics unprecedented, or is Trump merely populism revisited?” and “What can we learn from past attempts to learn from the past?” Mr. Ferguson is no stranger to controversy. But on Thursday he acknowledged that the conference needed more diversity. “Everybody was keenly aware that it was too white and too male,” he said. The problem was “explicitly discussed” ahead of the event, Mr. Ferguson said. He also said that women had been invited, but all, except one, were unable to attend. With 70 days until the June primary election, the California Charter Schools Association Tuesday strongly endorsed former Los Angeles Mayor Antonio Villaraigosa for governor, while harshly criticizing Lt. Gov. Gavin Newsom, the current front-runner in the race to replace Gov. Jerry Brown. The endorsement did not come as a major surprise, as Newsom has been endorsed by California’s teachers unions, which in recent years have launched a high-profile campaign seeking more transparency in charter school finances and operations. But what was striking about the charter school association’s endorsement was the vehemence against Newsom that accompanied it. In a speech delivered at the Charter School Association’s annual meeting in San Diego, Jed Wallace, the organization’s president, said that if elected governor, Newsom would “inflict major harm on our schools and claim to be our friend. ” Newsom’s campaign, in turn, rejected these attacks as “name-calling and distortion” and that he supported “reputable” and “innovative” nonprofit charter schools. Are private schools really better than public schools? A look at the data. We live in the age of Big Data. People no longer seem to trust intuition, experience or observation, and anecdotal evidence causes the eyes to glaze over. If you have a thought, chances are good that few will take it seriously unless some sort of research supports it. Conclusions and evidence based on research-produced numbers increasingly determine not only the direction of decisions but whether a new idea is even considered. Research and data can certainly be important tools in assessing claims and effectiveness and in guiding people as they explore new initiatives, but the elevation of data to a sort of monotheism is dangerous. Numbers offer only one view of reality. Experience offers another. The worship of numbers, especially when those numbers present a reality sharply at odds with the reality that people actually live, can limit or stifle change and innovation. It’s March, which means it’s “choice” season for a lot families living in urban areas. Like many households, mine is on pins and needles waiting to learn where our teenage daughter has been accepted to high school. She has taken three different standardized tests to be considered for admission at various public, Catholic and independent schools. She tried to convince us to hire a tutor, as some of her peers’ parents have, to give her advantage on these tests. We refused, because it seemed a bit much for eighth grade. Her father and I have spent hours crafting essays and filling out applications. We played in the local lottery to attend schools across town. We have taken off work to take her to visit school after school, where she has arrived, nervous in starched shirts, legs carefully crossed, to implore administrators to accept her. She is 14. We have done all of this so we can avoid our struggling neighborhood school. This system of school choice has powerful backers. The most influential is Education Secretary Betsy DeVos, the billionaire heiress whose proposed budget would pump hundreds of millions of dollars into the various privatizations schemes such as vouchers and charters that power this system of “choice.” Washington, D.C., where I live, recently lost yet another city schools chancellor when it was revealed he had jumped the line to choose a school for his own daughter. Antwan Wilson resigned for violating a policy that he had authored, a policy that was supposed to stop well-connected parents and officials from gaming the system to win their kids spots at top schools. Wilson apologized, explaining that he got “tunnel vision” in trying to make the best choice he could for his own child. He’s wrong about this. The tunnel is the feature, not the bug, of school choice. It is the same dark tunnel into which DeVos herself gazed, when she dodged Michigan state taxes for public schools that her own children might have attended if not for her fortune. Radical self-interest and self-preservation is the rotten, racist core of the whole ideology of school choice. There is no “we” in this: The entire point is to give individual kids an advantage. In putting his daughter above everyone else, Wilson used the school choice system precisely as it’s designed to operate.